In 2011, I first went to Belize as I felt “stuck” personally, spiritually and professionally. My father was dying, my best friend moved across the country, and I was considering leaving an ever stressful job after 14 years. A friend, who owned property in Belize, suggested that I go and spend some well deserved “down-time” on the white beaches of Central America. By the second day, I was playing with children on the beach. They would find me during their lunch hour and after school, and we would play theatre games. On day three, I walked them home so that I could meet their families. I cannot properly explain the difference between the tourist side of the island of Ambergris Caye and the reality of some of the locals’ living conditions. No electricity nor plumbing is common. A 14’ x 14’ structure, with only a mattress, is home for too many families. Clapboard houses are built upon garbage dumps. When TripAdvisor named this island the #1 in the world in 2014, they obviously had not taken the short walk across the bridge. I returned to Belize six weeks later with a team of 19 amazing students from the University of Sioux Falls. Our goal was to build a playground at the school located in this impoverished area. During this trip, I acquired a shadow named Brittany. She would not only follow me home every day; there were mornings that she would be sleeping outside my door when I awoke. She enthusiastically explained, “I don’t know if you have this television show in the States, but there is a show on our TV, where an old man goes around the world and saves the babies. I want to do this with him.” What this sweet 12-year-old girl was describing was the Christian Children’s Fund infomercial. The brutal irony is that she had no idea that she was one of those children. It was then that I told her that if she never missed school and got good grades, someday I would try to bring her to the States for a year. Brittany did everything in her power to make my promise her reality. At 14, she got herself to the mainland, which is a 90-minute boat ride. She navigated her way to Belmopan, the capital of Belize, and waited outside the Department of Education and the United States Embassy buildings for until she finally got an appointment and the paperwork. She filled it out all and repeated the trip, with her mother in tow. That May, when I arrived on the island, she was waiting to show me that she had held up her part and was ready to go. Brittany attended school in Sioux Falls during the 2014-15 school year. Her return to Belize was brutal for all of us. Despite the fact that I would see her on a regular basis during my trips, not having her in my daily life was heartbreaking. I went back to Belize with her as I, with the financial help of former students and family, sponsor numerous children and work at two schools on the island. June is a month where I need to be there to organize care-taking (food, supervision, etc. for all my “street kids”) once school is out for summer. When Brittany and I went to the high school to register her for fall, they informed us that she would have to retake her junior year. This was a total “bait and switch” on the school’s part. Frankly, she was being punished for her good fortune. No negotiation was entertained. Upon her return to Belize, Brittany was ostracized by classmates and even treated harshly by some of the faculty. At home, like always, things were hard. By Christmas of 2015, I sensed something was wrong as Brittany was not answering texts or emails. When I arrived on the island in February, I discovered that she had not been in school for weeks. She was home helping with her mother’s cooking business. I have a good relationship with Britt’s whole family, including her mother, so there were a lot of conversations about the situation. According to her mom, Brittany was not the same when she came back from The States. She never slept, and she got extreme headaches. Her mom had taken her to the doctor a couple of times, and they gave her a prescription. My guess is that it was an anti-depressant. However, it never got filled because her mother had no money to pay for it. There is no mental health counseling on the island. All of the flags pointed to a severe depression. 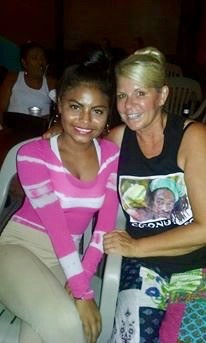 I got Brittany back into school in Belize, and she lived with me as throughout my February/March trip. She returned to her house when I left; it all fell apart – again. She did not finish the year. In June, upon my returned, she – again – stayed with me. When she is with me, Brittany is a girl I in which I fell in love. She is that open, highly communicative, smiling, lovely kid that I met years ago, and the young woman who lived with me in Sioux Falls. At her house, I see her physically shrink. One morning, at breakfast, I asked her, “Brittany, what happened? She sat there for a long time as she chose her words. Getting Britt back to Sioux Falls included more and higher roadblocks than I had ever encountered. Brittany can only come into the States on an I20 student status as she is not coming through an agency. There are no “foreign exchange programs” in place in Belize or most Third World Countries. One of my very favorite qualities of Britt is her unbridled enthusiasm to try everything! She has been a regular participant in service projects – especially with trips to Rosebud. I have wondered how that must feel, going to places that look so much like home, yet those children assuming she grew up so different from them. Here is where I must include her passion for children. At church, I find her many times wiggling her way into a family so that she can talk to a toddler or hold a new baby. She has been lucky to find a few families that regularly call her to babysit too. She has been a regular member of the student prayer group – Collusion; in fact, one new group of Spanish speaking students was organized of which Brittany helped lead. As a member of the Choir, she has traveled to Chicago and other Midwest cities to explore and perform. Brittany is also a very gifted artist and was selected to participate in a live exhibit at Avera Cancer Institute’s Night of Remembrance. Where Brittany excels is in the performing arts. For the past two years, she has represented her school at the South Dakota State Oral Interpretation Festival where she has been recognized as a superior performer in poetry. Along the way, she was a finalist and/or winner in approximately ten tournaments in two years. She has been part of or featured in: Ephemeral Production’s Page to Stage, musical theatre for children; March in Arms’ music video “Ashes;” the musical West Side Story, local commercials, and numerous modeling engagements. Brittany’s involvement in Up With People will be the vehicle she needs to take what she has learned these past three years and share them with children and families throughout the world. At the same time, she will continue to learn and grow through the programming and its dedication to service. Her ultimate goal is to take all her education and experiences home to the country of Belize and be the instrument of change. She has every intention of being the next Condoleezza Rice of Belize, and with the help of our community, we can all take some pride in knowing we helped her make her country a better place for the next generations.